When I browse YouTube from the Safari browser on my IOS (iPhone or iPad) adult only content is filtered out and access to adult language containing videos/pages is blocked. But when I use YouTube App on the same device I am able to see the adult pages/comments/video. Why is that? The native YouTube App on your IOS device uses special binary protocol ( application/x-protobuf ) to send the words/phrases typed in the search box to YouTube servers. This same protocol is used to get the contents with videos, comments and titles from YouTube servers. Unfortunately our application cannot filter this protocol yet. For now the only solution is to block native YouTube App use Internet browser to access YouTube. 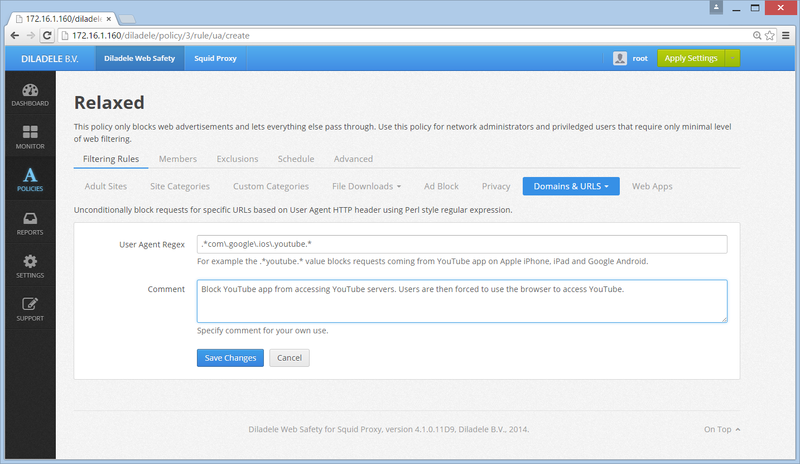 The following screenshot shows how to block the YouTube App by adding a User-Agent block rule for .*com.google.ios.youtube. * in the Web UI.